Believe it or not, doors make a style statement and they are increasingly recognised as one of the must-have accessories in a home’s makeover. It may seem strange that a functional item, like a door, can be seen as an accessory. If you take a look at the variety of styles and colours available, you will see that the once humble door can now stand out and create that much talked about WOW factor! Door trends do not change as frequently as in clothing fashion; they gradually evolve, influenced by popular home décor styles. From wall paper patterns, to kitchen design themes, to flooring styles and furnishings – they all influence today’s most popular door styles. Which internal doors will be in hot demand for 2015? There are three door finishes that have been increasing in popularity during the last 12 months which we predict will form the basis of 2015’s must-have door designs. Gorgeous grey really has to be at the top of the list. Whether you opt for a sumptuous dark grey finish or choose to paint a primed door light grey, you’ll be following the latest trend setters. Top interior designers are choosing to base their room themes on natural shades of grey, which complement each other perfectly, as well as suiting an array of brighter accent colours should you wish to include a touch of vibrancy. 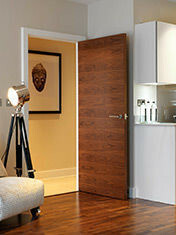 Rich walnut pre-finished interior doors add luxury and a touch of warmth to a home’s interior. You may think that walnut is a rather traditional choice, which it can be if you’re styling a classic theme, but look out for the new flush walnut style door designs. The clever way that walnut veneers are now positioned to enhance the horizontal and vertical timber graining, allows the creation of some truly stunning contemporary designs. Light and refreshing white internal doors never fall out of fashion but there is a definite move away from the long established white moulded panel doors - a favourite with larger house builders for many years. 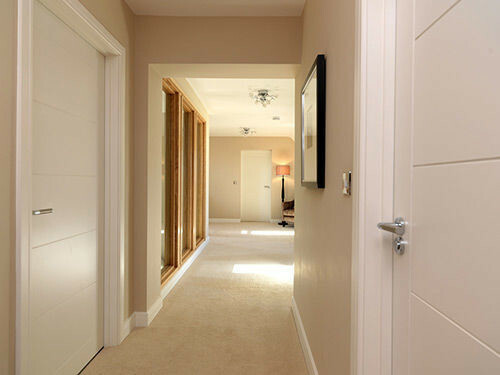 Flush white doors accentuated with groove patterns and shaker style designs are definitely the way forward. These clean and stylish designs create a contemporary look, which doesn't date with time. 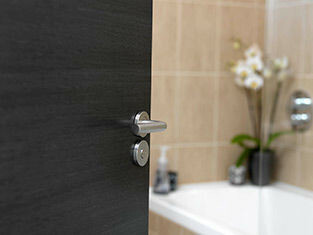 Plus you have the option to paint them a different colour in the future – very versatile! So, if you are planning to renovate or restyle your home in 2015, don’t forget to consider your internal doors – as they play an important part in the overall interior design theme.